Today I'm participating in the Pretty Pink Posh New Release Blog Hop in addition to adding another day onto the 12 Days of Christmas series that has been slowly rolling out this month. I decided to use Distress Oxide inks to colour my various stamps that I combined from the Poinsettias set and the Elegant Holly Set in today's video. There are 4x $25 gift certificates up for grabs - be sure to leave a comment on the blogs for a chance to win one of the prizes. Winners will be announced November 20th on the Pretty Pink Posh Blog. Great idea to add berries to the red background! So pretty! Gorgeous! What a unique technique! Those two sets were a match made in Heaven, Justine... gorgeous color choices, too! A gorgeous card! Beautiful card! I like the inked backgrounds as the ‘coloring’ for the flowers & leaves. Thank you for sharing! Beautiful card! I have yet to use my oxides to color, thanks for the inspiration! Great job as usual. TFS. Pretty card, love the distress oxide coloring. Oh my!!! What cheerful card!!! Gorgeous Poinsettias!!! Love this cards and the entire release! your card is beautiful. I have several poinsettia stamps but the holly set is really speaking to me. Thanks for sharing this. Love the use of distress oxide inks for the coloring of the poinsettias and holly! Your card is beautiful. Beautiful card! Love the coloring! I love your beautiful combination of poinsettias and berries! It looks really fun and fresh! I am new to distress oxide inks and lovin' 'em! Beautiful card! I love the softness of the poinsettias using the oxides- so beautiful! Lovely! I really like how you colored to the edges of the die cuts! How sweet!!! Love this card! Your coloring is awesome on this card. Very bright and cheerful!! I love the way you layered everything on it also too. Sweet card, Justine, thanks for sharing and inspiring! A very nice and elegant card. Love the way you combined the Holly leaves and the poinsettias. Subtle colors make it look very chic. Love the poinsettia card! Great coloring and technique! Beautiful card! I love Distress Oxide inks. Beautiful poinsettias and gorgeous card ! What a perfect card for christmas ! Thanks for sharing and the chance to win ! I like the poinsettia mixed with the holly. It made for a perfect card. I love both of these sets. Nice card. Your card is sooo pretty! I love how the oxide inks turned out! Really cute card. Love the way you did your flowers and holly with distress inks! Gorgeous poinsettias!! Gorgeous coloring with the Distress Ink! Lovely! Poinsettias are one of my favorites! Loved this tutorial, great techniques! And the card is very pretty. Beautiful card with these pretty poinsettias! Love your beautiful card. Wonderful design idea. Fantastic card! 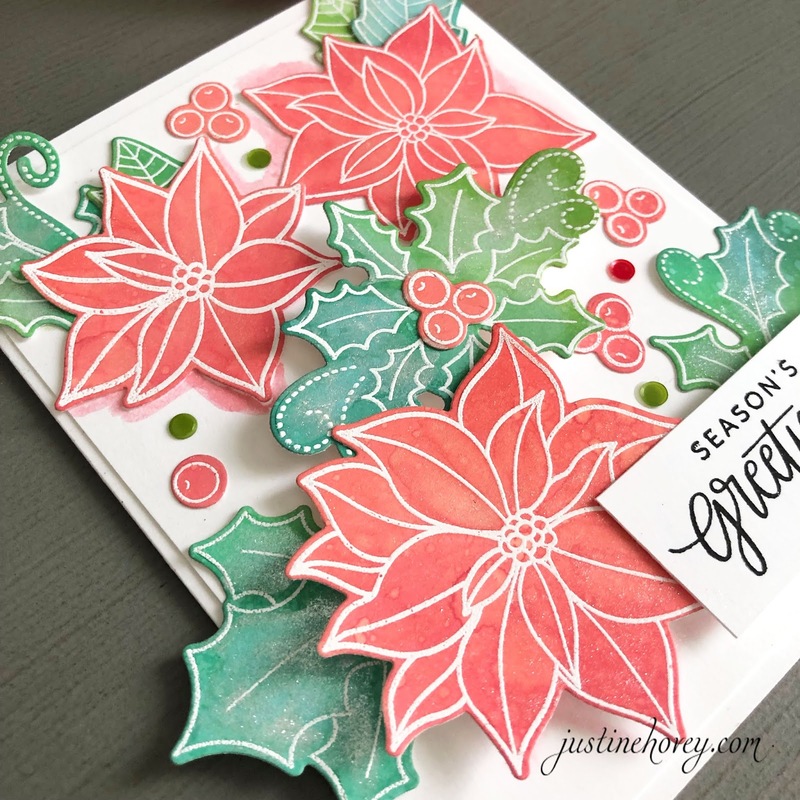 I really like the Poinsettia's and how you used distressed inks to color them! Very lovely looking! Beautiful card! I love how you used multiple colors from the same color family to create your paper for the poinsettias and the holly leaves. Instant shading! Very pretty card! Thank you for sharing your process. Enjoying all your Christmas card creations you are sharing. This poinsettia card is lovely too with the layered design. Thanks for sharing. Beautiful card! I love the idea of ink blending to make the coloring go a little faster. Very pretty, Justine! Awesome coloring! So pretty! These poinsettias are lovely! Oh this is fantastic! Love all the details! Beautiful poinsettia card, love these DOX color combos, such a nice blend. What a stunning card Justine! Absolutely gorgeous. 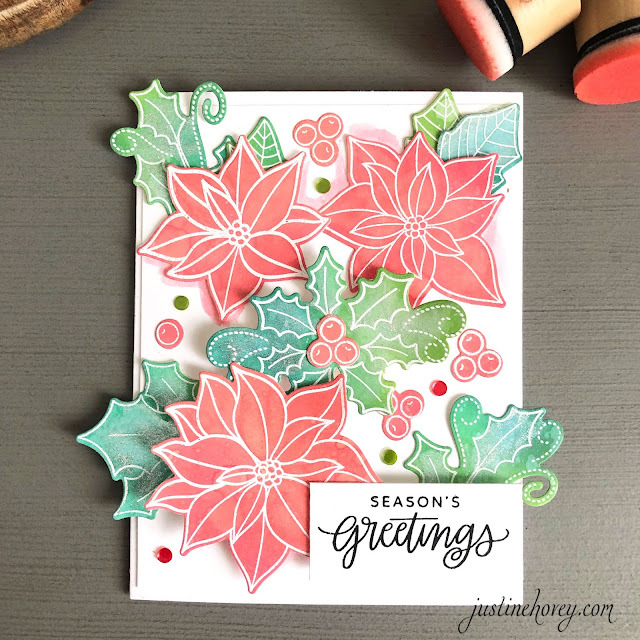 Loving all the dimension on your pretty poinsettia card! Beautiful card! I like the distress oxide coloring. I will have to give that a try. Stunning and so much dimension, wow! Love that you colored with the distress oxides! sweet card. it looks vaguely scandanavian to me - which is good in our family lol!! i like your new profile pic too - but i also like your glasses. Very pretty card, the colors are soft enough to allow you to enjoy all the PPP Pointsettias. Very nice design. Thank you for sharing. This is the kind of coloring I need this Christmas: simple yet still has the wow factor. I also really like how the white embossing looks when it's filled in beyond the edges. I've had a hard time with it sometimes because losing that outside edge makes a difference. I'll have to try this. Thanks for sharing! Great idea to make a background and use it as your "ink"! Thanks! Request the writers of StudentsAssignmentHelp.com for Assignment Writing services UK. Every day we are working with best assignment work to all the students at a amazing cost. Also we keep in mind the formatting style to be used in your paper. So, acquire the best assignment writing help from our experts.